My aunt was diagnosed with Alzheimer's several years ago, and watching that steady decline is heartbreaking. My uncle has been doing an outstandingly amazing job of taking care of her over those years, but since Christmas she has declined quickly and my uncle just can't keep up. A couple of weeks ago, he moved her into an assisted living facility where the staff can keep watch over her 24 hours a day - and my uncle can get some well earned rest. The doctors have indicated that the end is near, and although she may not know who I am anymore, I certainly know who she is, and I decided that I needed to visit. I arrived at my uncle's house this afternoon, and time being of the essence, we left almost immediately for the assisted living facility. As expected, my aunt did not know me. But, I had an idea. Memory loss tends to occur to the most recent memories first, while the earliest memories are the likeliest to remain in tact. Though I was not present for my aunt's early memories, I'm a genealogist (and therefore the keeper of the old photographs), and I have a smart phone. So I pulled out my phone, loaded up my tree from Ancestry, and started showing my aunt photos. For each photo, I asked who was in the picture. She immediately recognized her own parents and named them as Mom and Dad. She identified her maternal grandmother as Nana. And when I showed her a picture of my uncle from when they first started dating, and asked her who that handsome devil was - she pointed right at my uncle! A few minutes later, she called to him by name - something she had apparently not done in weeks. And even though my aunt did not know me, in that moment, she knew her husband again, and the happily stunned look on my uncle's face was the BEST THING EVER. It was a spark of hope in a time of suffering, and I will cherish that visit, and that memory (one that likely never even entered my aunt's mind). THAT is family. THAT is what it is all about. UPDATE 1 Mar 2018: Today my aunt passed away. Her ordeal with memory loss, and my uncle's ordeal in caring for her, are over. And I am more glad than ever that I took the time to visit before the end, and created a last happy memory with her. Carrolls and Mulveys and Irish, Oh, My! This weekend I made more discoveries on one of my Irish lines. Using a combination of burial information from my trip to the Family History Library last February and some New Jersey vital records, with a few census records thrown in, I think I've captured a picture of another generation back, to my 3rd great grandparents. I started with the information on who was buried in plot G L 13 at Holy Name Cemetery in Jersey City, NJ. This is where my great-grandfather James Carroll was buried in 1911. 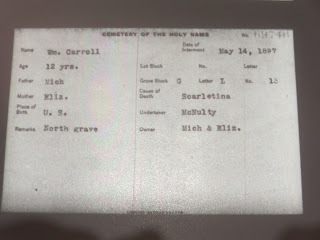 According to the Holy Name Cemetery records, the plot was owned by Michael and Elizabeth (Mulvey) Carroll, James' parents. Looking through the records of all who are buried in that plot, I found some previously unknown relatives, and a number of names I did not recognize at all. So, time to sort them out! The first person buried in this plot was William Carroll. The plot was purchased on May 14, 1897, by Michael and Elizabeth Carroll, and that was the date that William, their 12 year old son, was buried there. 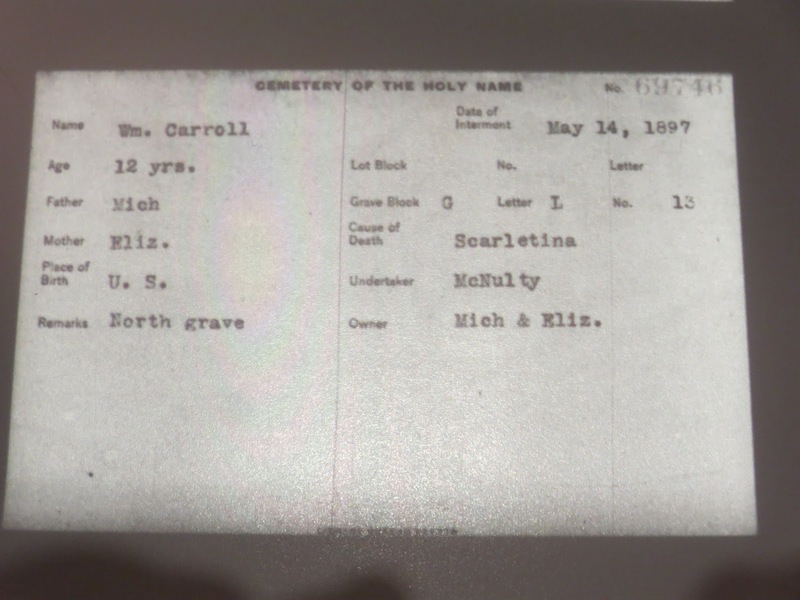 The next burial in that plot appears to be Michael Carroll himself, on April 3, 1900, at age 42. Michael's death record indicates that he was a widower when he died, implying that his wife Elizabeth Mulvey Carroll passed away sometime between the purchasing of the cemetery plot in May of 1897 and Michael's death in April 1900. Why there is no record of her burial here is mystery for another time! The next burial was that of 7 month old Catherine O'Brien in July 1907, daughter of Thomas and Nellie. Since up until this point, there have been no O'Briens in my tree, I started with the theory that Nellie was a Carroll. So I searched for marriage records for Thomas O'Brien and Nellie Carroll around 1906 or earlier. And what do you know - Thomas Francis O'Brien married Ellen Elizabeth Carroll, daughter of Michael Carroll and Elizabeth Mulvey, on February 11, 1906. So now I have learned that James had a brother, William, and a sister, Ellen (Nellie). In 1900, both parents are deceased as is his brother, so instead of looking for James Carroll, son of Michael and Elizabeth, I need to search for James Carroll and sister Nellie in the 1900 US Census. And I find James, born November 1876, which matches the birth date on his death record, in the 1900 US Census with sister Nellie, born September 1880, as nephew and niece in the household of John Callery and his wife Catherine. Callery here is not a misspelling of Carroll - the census record has distinct last names for niece and nephew compared to head of household. And that implies that John's wife Catherine is the blood-related aunt, either a Carroll or a Mulvey. So, it's back to the marriage records, in search of John Callery's marriage. In 1876 he married Catherine Mulvey, daughter of James and Catherine Mulvey. And so, James and Catherine Mulvey are my 3rd great grandparents! This past weekend, WikiTree sponsored a Source-a-Thon - a challenge to update as many profiles as possible with legitimate sources. Since I had a free weekend, and despite the insanity that was work in September, managed to hear about it a few days before it was going to happen, I decided to register and see what it was all about. I was assigned a "race number" (413), and participants were organized into teams. I was assigned to Team Tennessee. Each team was essentially a smaller group to keep tallies on how many profiles were being sourced throughout the event. 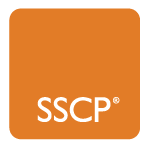 The teams had separate forum threads in which the members posted their updates of sourced profiles. Periodically the team captains would provide summary information to the WikiTree leaders so they could keep track of the overall progress. Because of course, there would be prizes for the winners! The race started at midnight on Saturday morning, and I put my own house in order first. I had a number of my relatives that had not been documented yet within WikiTree, and that was just a matter of adding the sources I had in Family Tree Maker into the appropriate WikiTree profiles. Those Irish had a whole pile of Jersey City city directories to enter, so that took awhile. But I was finished with my 16 profiles by lunch time on Saturday (and I had about 5 hours of sleep in there, too! ), and then I moved on to tackle unrelated Swedes, armed with my ArkivDigital subscription and my copy of the Swedish Death Index, 1901-2013. Oddly for me, I was not feeling at all competitive in this environment (though clearly some folks were! ), despite the bragging rights for largest number of profiles sourced by individual and by team. I just wanted to source the profiles I worked on as well as I could. 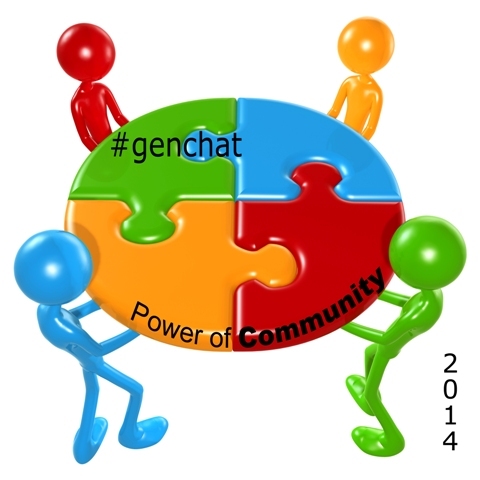 In the case of genealogy sources, quality is better than quantity! Luckily, my team captain felt the same way, and there was no pressure to do any more than I felt comfortable doing. One of the interesting aspects of this challenge was the online hangout/chat that happened every 2 hours throughout the 3 days. Some of the WikiTree leaders would run the hangouts, give the updates posted by the teams, and give away prizes randomly selected by race number. This social interaction aspect was great fun! I had been tossed into a group of complete strangers, and came away with some new friends from the forums and especially the live chats. It was also a way to stay motivated. So often in genealogy we are working in a little vacuum of our own, on our own stuff, and it is nice to be able to have some social interaction with folks as obsessed with dead people as you are. :) When you get tired, or frustrated by some crazy family linkages, there are other folks right there sympathizing, helping get through the roadblock, and just understanding exactly what you're going through, since they are right there in the trenches with you. I sourced 100 profiles over the 3 days, and decided to stop there about 2 hours before the end, deciding that I needed to look as something that wasn't Swedish for a bit. :) In my continuing 2016 genealogy winning streak, I also won one of the prizes in a 4 am giveaway. All in all, an exhausting but fun experience. I will probably do it again sometime. But not until I've had several months to catch up on sleep! I have been making good progress connecting some of my Italian DNA matches to each other. Eventually I will have to figure out how they connect to me, but connecting them up makes me feel like I've accomplished something! I have been working through my Italian DNA matches on AncestryDNA, creating new online private trees to trace their family lines. In some cases I've been able to trace back several generations more than my matches have in their trees, at which point I generally share my work privately with that match. The third match is more challenging. She is the daughter of an adoptee, and his father, George Larro, is the connection point. But she has very little information on this ancestor, and trying to connect with living cousins, some of whom don't want to know about the family line abandoned by George so long ago, is difficult. We have some theories on how he might connect to the tree, but I am leaving that to her to pursue. In addition to these shared matches, I have a connection-by-marriage with another DNA test taker who shares these same three matches. However, he and my father's DNA tests do not show up as matches to each other on AncestryDNA. Our marriage connection is via my Giordano line and his Lerro line, and that shared line makes my cousin in Italy his cousin, too, through opposite sides of that marriage. But we suspect we are related by blood as well, since we have a number of shared DNA matches. Not only do we share on the Larro/Lerro group above, but we also share matches with the group I connected back in March. So we are both convinced we are cousins. We just have to figure out how! Today I finished indexing the last of the Omignano death records that were in form layout, so I have now completed the years 1875 - 1929. That's the end of the civil records available in the image collection on Family Search. YAY! The next step in this indexing process should be to read the fully handwritten death records from 1866 - 1874, but I may postpone that in favor of birth or marriage record forms. As I was indexing the death records in 1926 and 1927, I noticed that the name of the recorder on some of the records looked familiar - Silvino Lerro. I have a 2nd cousin 2x removed by that name! It turns out that he worked as a clerk in Omignano for a while. So not only am I reading records about my relatives, I am seeing the handwriting and signature of one of my relatives recording it! How cool is that?!? Pretty darn cool, in my opinion. Just a little icing on the cake for wrapping up this record set. In the meantime, I will be taking an indexing break before starting the next batch. 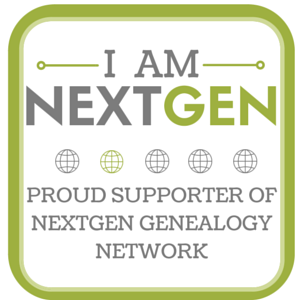 There are some other genealogy tasks on the to-do list! Today I reached another indexing milestone on the Omignano records on FamilySearch.org - I've completed indexing the deaths from 1897 - 1917. The last few records were heartbreaking, as they were records of deaths outside Omignano reported back to the town of soldiers who died in World War I. Word was sent to the town in 1917 about the deaths of three soldiers that had occurred in the summer of 1915. One of the deaths recorded in 1916 is that of Giuseppe Cammarota, my first cousin 3x removed through his grandparents (my 3x great grandparents), Giuseppe Cammarota and Antonia Petillo. Giuseppe served in Italy's 48th infantry regiment. He was injured with an abdominal wound at the Ninth Battle of the Isonzo, in Gorizia, Friuli-Venezia Giulia, Italy. After his injury, he was transported to the hospital at camp 79, where he died of his wounds. Prior to this, I didn't know of any blood relatives involved in WWI - only in-laws. But now, with a blood relative on the field, this part of history became more important to me. The death record, of course, does not indicate that my cousin participated in the Ninth Battle of the Isonzo. Learning of his death as a soldier at Gorizia on 3 Nov 1916, I did a little research on WWI to find out what was going on at that time and place. The Italians fought the Austro-Hungarians along the Isonzo river throughout the war. The conflict occurring Nov 1-4, 1916 was termed the 9th such battle. According to the death record, Giuseppe was buried in an Italian military cemetery in Gradisca, Italy. I may need to visit someday! Two citizenships are better than one? As I was putting together my Italian documentation for my research win with Lo Schiavo Genealogica, I noted that one of the other services they provide is helping people apply for US-Italian dual citizenship. So I did a little digging, and it looks like I am eligible for Italian citizenship. According to Italian Law 91 of February 5, 1992, one can have Italian citizenship by descent or bloodline, known as jus/jure sanguinis. Following some specific guidelines, and assuming no one renounced Italian citizenship along the way, many individuals of Italian descent living elsewhere can have their birth right of Italian citizenship recognized by proving the direct line of descent. My paternal great grandfather was born in Italy and immigrated to America in 1889, which is after 1861, when the present-day country of Italy was formed. Once in America, he did not become a naturalized US citizen - he completed an Alien Registration file in 1940, and his death certificate from 1950 showed his citizenship to still be Italian. Therefore my grandfather was born in the US to an Italian citizen, making him a citizen of the US and Italy. And that right of citizenship passes through my grandfather to my father to me. There are numerous businesses that provide services to put together the paperwork required to have Italian citizenship by descent recognized by the Italian government. 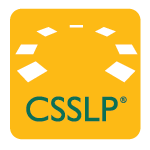 Official birth and marriage records for all generations between you and the Italian immigrant, proof of non-citizenship of the Italian immigrant in the new country when descendants were born, translation of all non-Italian records into Italian, and an apostille (a type of legal certification recognized internationally) for each are required as part of the request package. The more generations back to Italy, the more paperwork - there is always red tape! Citizenship in Italy includes a number of benefits, such as the ability to apply for an Italian passport and travel as a European Union citizen in Europe, access to education and health care, and less hoops to jump through to acquire property in Italy. There are also potential drawbacks, however. The Department of State has some warnings about dual nationality, including potential law conflicts as well as making it more difficult to protect US citizens abroad, especially when in their other country of citizenship. If you are looking to hold a job that requires a US security clearance, having allegiance to a second country, or worse, actively seeking it, is perhaps not the best move. So, it is something to consider. Since I currently don't possess the NYC birth and marriage certificates for my grandfather's birth and my great-grandparent's marriage, not to mention the official Swedish birth certificate for my Swedish great-grandmother, it is a moot point for me at the moment. But it is still cool that I *could* claim Italian citizenship. ©2016 Kim Jordan. Simple theme. Theme images by Ollustrator. Powered by Blogger.